We created these birthday cake sheet pan pancakes because my daughter would request funfetti pancakes every year for her birthday. I either had to rush to work or she had to rush to school so I found a way to make more pancakes faster so everyone could enjoy them. 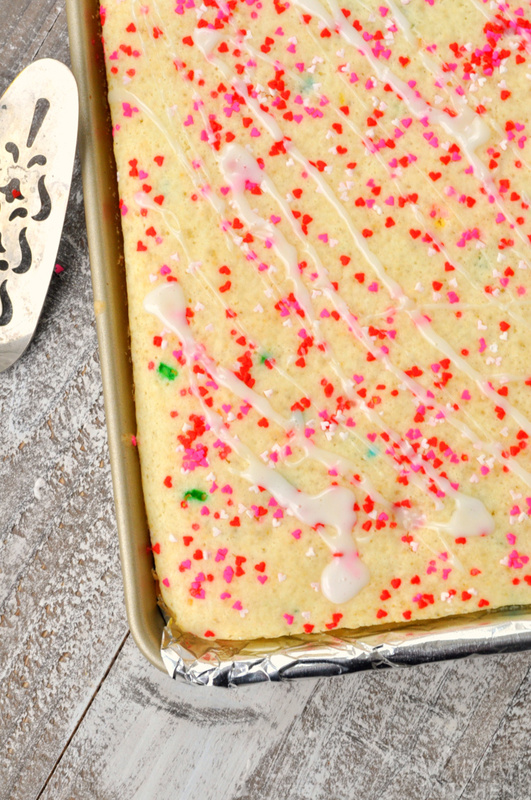 The ingredients to make these funfetti sheet pan pancakes are pretty simple. 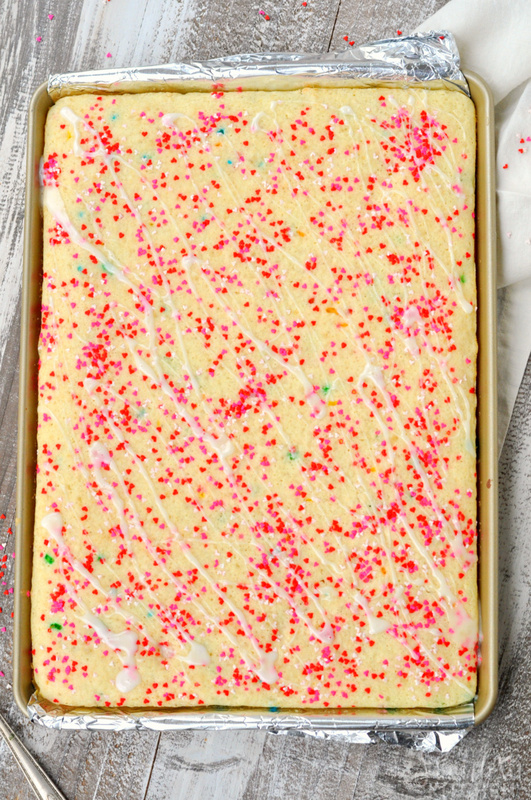 I always add additional sprinkles to the batter and on top but that is purely optional! You will definitely need a rimmed sheet pan to make these. I always line mine with nonstick foil too make them extra easy to get out of the pan. Want to make them even more like a cake? Use a round biscuit cutter to make circles and stack them up! 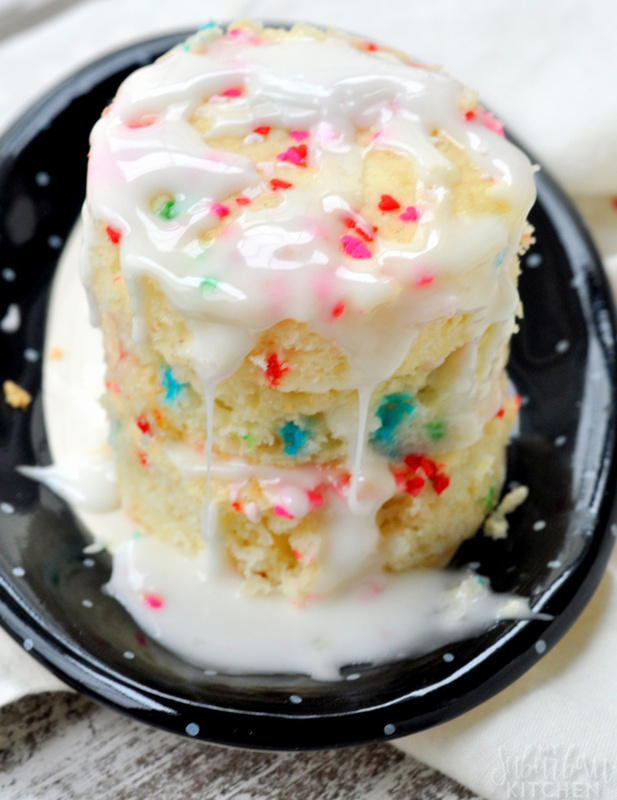 Of course, I know you are wondering: do these really taste like funfetti cake? I can confirm 100% that they do. 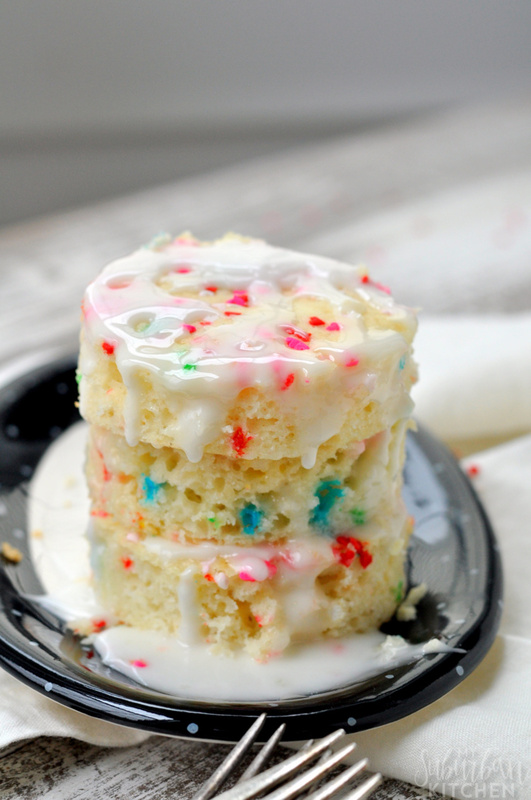 They have that perfect vanilla cake with sprinkles flavor. I can also confirm that, when I was recipe testing, I had all the kids asking me to make them every day for at least a week! We do a light powdered sugar glaze on top but you can switch that out with a buttercream icing for an extra decadent treat if you want. These are so fun to make and definitely a great way to get the kids involved in the kitchen if they are interested too. Just don’t forget the candles when you are celebrating with these birthday cake sheet pan pancakes. 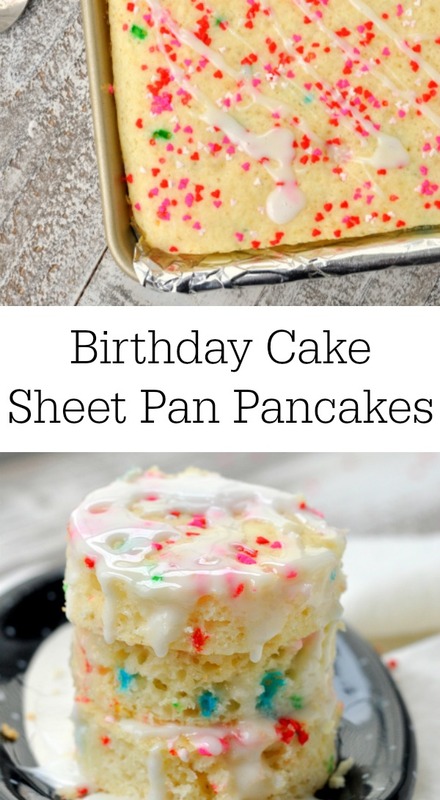 If you make these birthday cake sheet pan pancakes or any other recipe from the blog, I’d love to hear about your experience. Let me know in the comments or snap a photo and tag it #MySuburbanKitchen on Instagram or Twitter. 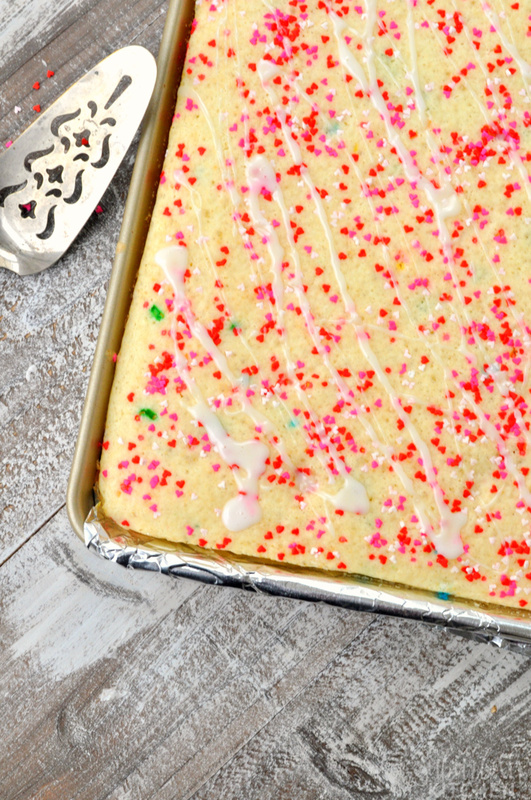 Create funfetti cake pancakes that are super easy thanks to being baked in a sheet pan. These birthday cake sheet pan pancakes are the perfect way to celebrate any birthday or special occasion. Preheat oven to 350 degrees. 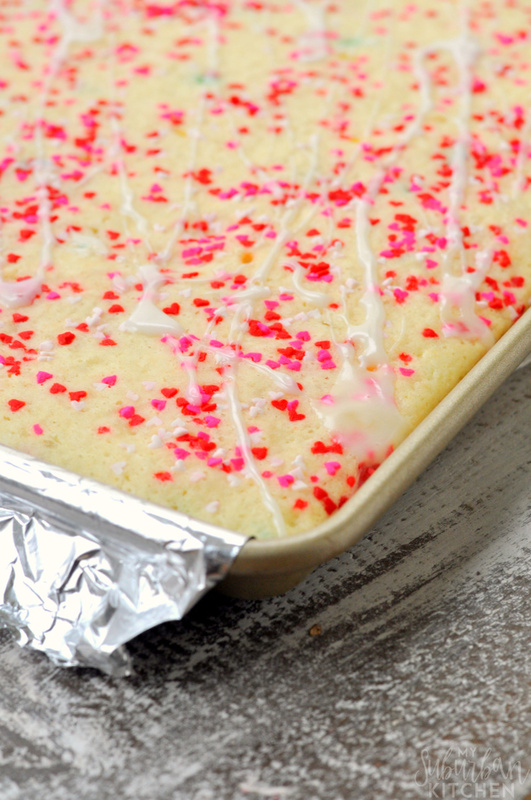 Line a rimmed sheet pan with nonstick foil. Set aside. 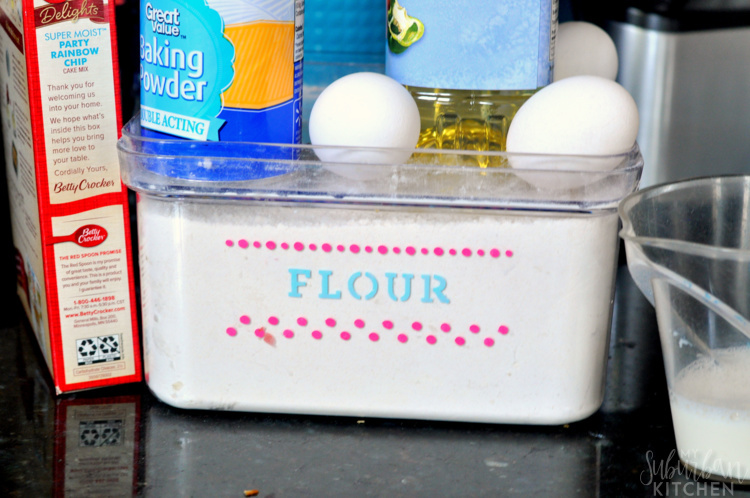 In a large mixing bowl, whisk together cake mix, flour, baking powder, and salt. In a separate mixing bowl, mix together oil, eggs, and milk. Mix until well combined. Add wet ingredients to bowl of dry ingredients. Mix until just combined. Pour into prepared sheet pan. Bake in preheated oven for 20-25 minutes or until set and lightly browned on top. In a mixing bowl, combine powdered sugar and 2 Tbsp of milk. Mix well. Add additional milk if needed to reach icing consistency. Pour on top of cooked pancakes and top with additional sprinkles.